At Party Cheap we carry dozens of pink baby shower decorations and party favors for your girl baby shower theme. Mix and match our party supplies for a baby girl along with pink tableware for a cute pink theme. The pink theme is obviously very popular with girl baby showers so we have a full line of solid pink decorations to go with these specific girl baby shower decorations. Check out our pink table covers, pink plates, and pink tissue decorations that will totally transform your room into a pink dream. If you want to announce to the world that you are expecting a baby girl, we suggest you pick up some of the ‘It's a Girl’ decorations that proudly proclaim you have a little princess on the way. We all know little girls love the princess party theme, so it should stand to reason that you would love it as well, since you are the Queen. Add in some princess items along with the pink baby shower items and give the Mom-to- be a Queen Tiara and a royal scepter so that she may preside over her baby shower in style. 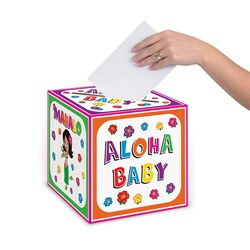 If you are hosting your baby girl shower in the middle of winter why not warm everyone up with the Hula Baby Shower theme. This unique theme combines baby shower decorations along with colorful luau decorations. Send out Hula invitations to let your guests know they will be attending a luau theme and encourage them to dress up in luau or beach theme clothes. And when they arrive at your luau theme baby shower give them colorful leis to make them feel part of the group.